VEVEY, Switzerland - April 30, 2018 - PRLog -- A century and a half is nothing short of spectacular in the long tradition of a magnificent hotel. And 150 years is just what Grand Hôtel du Lac is celebrating. Although its history had its ups and downs, Grand Hôtel du Lac is revered as a "little palace" along the shores of Lake Geneva. 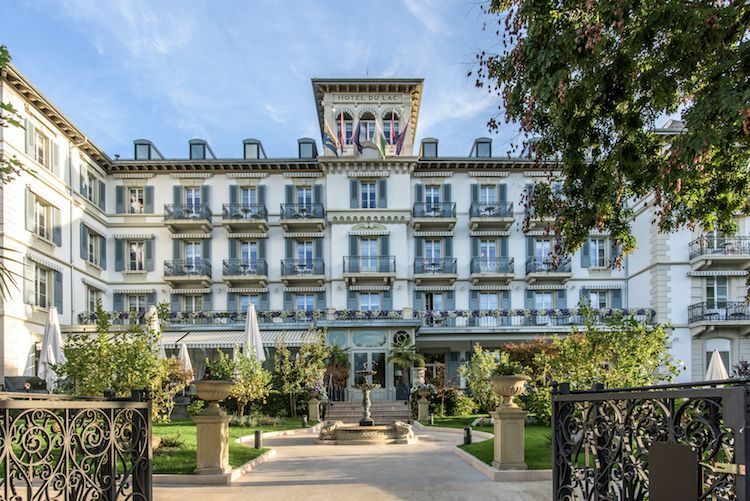 It began in 1867 with construction on a beautiful piece of property on the eastern boundary of the quaint village of Vevey, Switzerland, resulting in what was to be called Grand Hôtel du Lac. The splendid hotel opened with a grand banquet on December 18, 1868. Among all the luxury hotels, and through various family owners, Hôtel du Lac was well thought of and hosted nobles of every grade, religious leaders and personalities. Some personalities stayed in residence for extended periods of time. Various commemorative tablets around the property present highlights of the hotel's history. In 2005, Hôtel du Lac was sold to international hotel investors. These owners decided to recondition the "elderly lady of the lake," and closed the hotel for two years for an extensive renovation conducted by the world-renowned French interior architect Pierre-Yves Rochon. Their goal? To restore the property to the grand style initially envisioned in 1868. Grand Hôtel du Lac reopened on January 18, 2007 with a grand gala for 250 guests designed to represent the original opening festivities. A special 150th-anniversary logo was created to commemorate the milestone. Grand Hôtel du Lac is situated in the beautiful Lavaux wine region, part of the UNESCO World Heritage site. As a joint effort between winemaker Beat Bujard and the senior team of the hotel, a special cuvée wine was created to commemorate the anniversary. The white cuvée was created by blending the traditional Chasselas grape with Pinot Gris; the red cuvée is a Merlot blend. To celebrate this important year with guests, Grand Hôtel du Lac has invited some renowned international and national Michelin-starred chefs to share their culinary talents during two or three special anniversary dinners. A number of special offers will be issued throughout 2018 that are appealing in price and also link to the history of the hotel and the number 150. They may include a special dinner for two at 150 Swiss francs (about $160 USD) or a night in one of the beautiful hotel rooms at CHF 150. Grand Hôtel du Lac has engaged in a partnership with the brand Mont Blanc to create a very special gift for its most valuable guests and partners: a leather Mont Blanc notebook, embossed with the 150th anniversary logo. Celebrate in style at the five-star Grand Hôtel du Lac. Grand Hôtel du Lac is a five-star luxury hotel located in Vevey, Switzerland along the northern shores of Lake Geneva. Featuring exceptional views of the majestic French and Swiss Alps and the harbor of Vevey, this charming hotel offers 50 guest rooms and suites; the Dr. Burgener Switzerland Care & Spa; two restaurants: the Michelin Star-rated fine dining Les Saisons and the more casual La Veranda; and a bar, lounge and the Oriental Lounge.